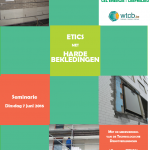 This project is focused on the retrofitting of existing façades in Brussels thanks to ETICS (External Thermal Insulation Composite Systems) as insulation technique because of its relevance in the reduction of Energy consumption context. 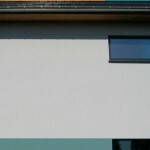 At the present day, the use of ETICS (with EPS as insulation for more than 90% of the market) is growing rapidly and this kind of system lets appear a great amount of emerging innovative solutions in particular concerning the components (new types of insulation panels for this use, new types of skin such as tiles). Nevertheless, some interrogations raise because of the lack of knowledge about the durability and avoid a full implementation of these new techniques. The aim of the research is to improve the knowledge of “new materials” when combined in ETICS thanks to experimental investigations and to disseminate the results to the sector. To disseminate the results to the sector. The main relevant results are the following. The screening and the synthesis of “smart properties” confered to finishing layers were realised showing the innovation potential. 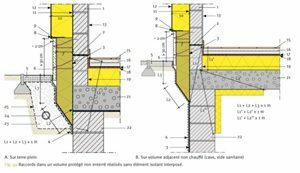 A lot of technical details have been established taking into account the energetic reglementation to limit thermal bridges (See Figures 1 & 2). 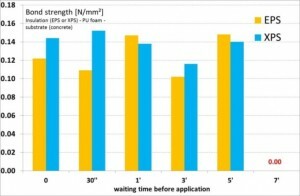 Specific PU foams can have interesting perspectives of use as adhesive for ETICS. They facilitate the setting up, accelerate the construction process. Nevertheless, their mechanical performances are quite lower than as well cementitious adhesives as the insulations they have to glue. Attention must also be paid to the short open time (∼ 7 minutes) (See Figure 3). 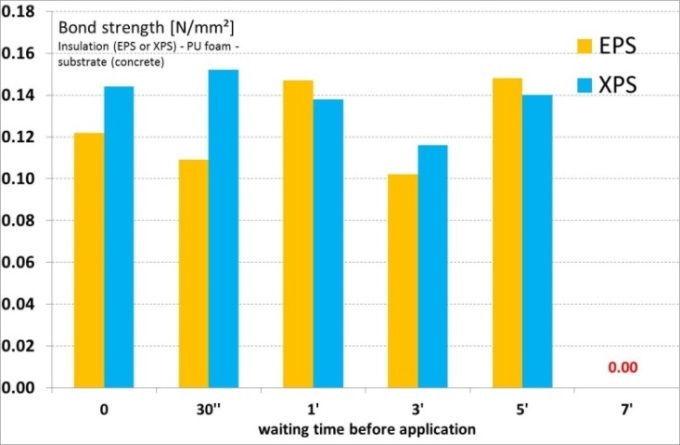 Experimental durability assessments on a rig (see figure 4) were performed for some emergent systems; the parametric study has concerned mainly the type of insulation materials. Even if in general no significant damages have been observed during artificial aging for the most of the evaluated combinations, loss of mechanical properties was observed (bond strength) and not all the tested combinations pass the test. 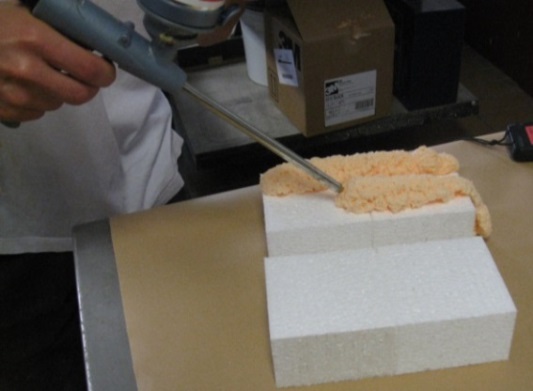 Tests on insulation panels selves have shown the sensibility to moisture for some of them (reduction of the tensile strength for fibres insulation materials and dimensional movement for fibres insulation materials and synthetic insulation materials). 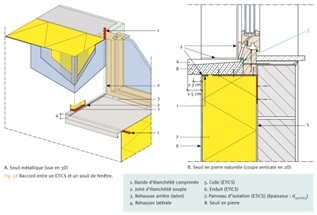 After having performed a literature review concerning the use of ETICS on timber frame, some numerical simulations of the hygrothermal behaviour were performed. The necessity to use adapted vapour barrier depending on several parameters was shown. The same kind of simulations was performed for tiles on insulations giving some recommendations to follow to avoid internal condensation. The followed cases have allowed exchanges and to gain experience from the practice. 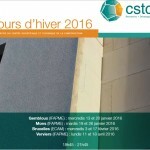 The number of valorisation activities have shown a real and great demand from the sector (industry, private sector). This valorisation of the project is realised thanks to technical presentations to working groups and technical Committees, to individual contacts, to public presentations and to publications. Besides the publications, the most important collective dissemination activities were five successful conferences on the topic organised by the project team and held in Brussel. The efficient use of energy is a main challenge of energy policy, not only because of climate protection objectives, but especially as we have to face limited resources and potentially further increasing energy costs. The building sector is one of the most energy consumers; a great amount of the energy use is caused by heating and cooling. 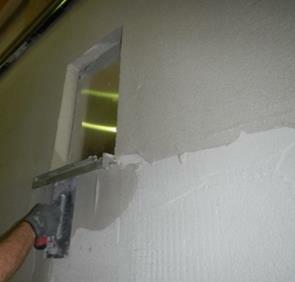 Its reduction is possible thanks to an adequate insulation of the building envelope. 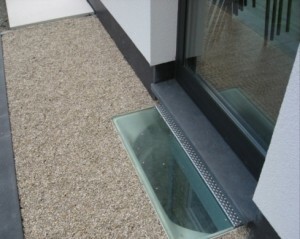 Within this context, the insulation of existing buildings is the biggest challenge.